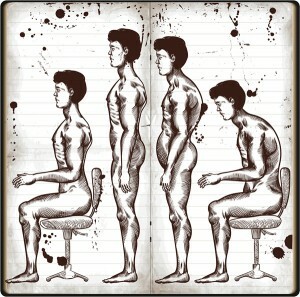 Prolonged sitting has been linked with obesity as well as elevated blood pressure, sugar levels, and cholesterol. Contrary to what some may believe routine exercise does NOT counteract the detrimental health effects of prolonged sitting. In fact, according to a study published in the British Journal of Sports Medicine, “Even if people meet the current recommendation of 30 minutes of physical activity on most days each week, there may be significant adverse metabolic and health effects from prolonged sitting — the activity that dominates most people’s remaining ‘non-exercise’ waking hours.” This means that routine exercise alone is not enough to combat the adverse effects of prolonged sitting. Furthermore, prolonged sitting negatively impacts the pelvic floor. Not only does it contribute to tightening of the pelvic floor muscles, but it can also contribute to pudendal nerve compression. So what are those of us who have desk jobs, who are students sitting through class all day, or who have to endure long conference meetings supposed to do? As I sit here at my own computer typing this blog, I must admit that even I, a physical therapist who spends majority of my time with patients, am also susceptible to extended periods of sitting at work. Take that Keurig or water cooler break that you were considering. Get in the habit of standing while talking on the phone. Take a stroll around the office to discuss matters with your colleague whenever possible rather than meeting in an office. With spring right around the corner, consider standing up and moving around outdoors during your lunch break. Encourage your employer to try using a standing desk or workstation – chances are that they will be more likely to order one for you if they themselves experience the benefits. Amy is in Prevention Magazine this month!